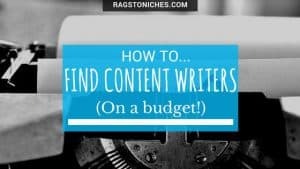 So, you’re looking for way to find content writers on a budget? Once a week… a few times a week… every day? Blogging can be extremely time consuming and it is certainly one of the key reasons that so many bloggers will quit prior to having any success with it at all. I recently read a post from a blogger who had well over 200 blog posts on their site … and had not made a single dime!! Now, while there will be a large number of reasons that contribute to WHY that is – but you can imagine how hard it must be to spend so many hours plugging away at something and see absolutely zero reward for your efforts. That is not an unusual story – it’s no wonder so many bloggers quit before they’ve made any money! In any case, at some stage many bloggers or website owners will consider outsourcing content to lighten the load and free up some time. Once you may have a bit of income coming in, outsourcing can be a way of taking your blog to the next level. If you’re largely relying on content writing and SEO efforts to generate traffic, then you are going to need a tonne of quality content. The more content that you produce, the quicker you can expect to grow. No… it’s not going to happen over night. Google rankings take their time, especially in the beginning if you don’t have any authority. But the more content you do put out, the more visibility you will gain over time and the more traffic coming to your blog. 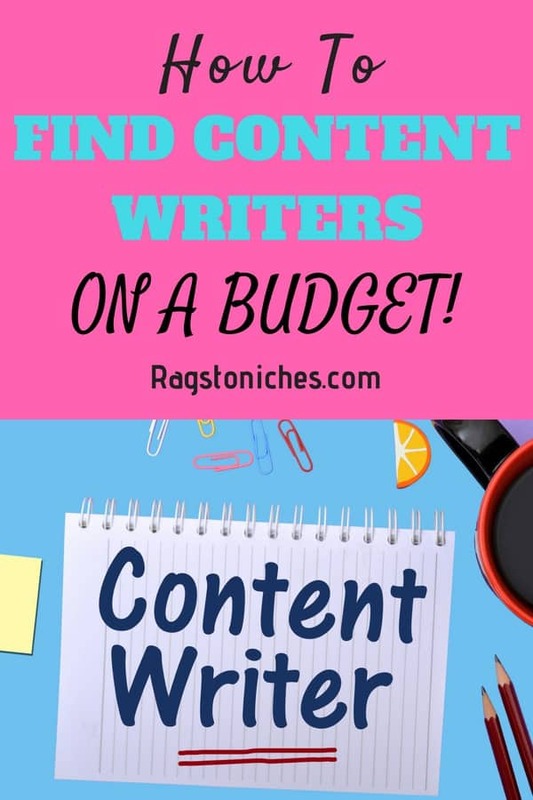 How do you find quality content on a budget…? You’re trying to make money after all… not spend it, right? Well, the saying you need to spend money to make money, is still true in many respects. Too many people look to make money online without spending anything at all and they want it to work quickly – which isn’t mindset going into it. Ultimately, it’s a good idea to invest something into your online business, just as you would in a regular business offline. I have certainly had plenty of negative experiences outsourcing though. The first article I tried was from Fiverr. I was unable to use it at all, it was that bad. And this was from a supposed five star seller! While Fiverr is certainly a good place for some things, it is not great for content – from my own experience. So, don’t expect much if you go down that route. There are a few websites that you may want to give a go -some better than others – so I will focus on a few I’m familiar with in this article. I’m going to start with my favourite place to outsource content. This is currently my go-to platform. If you’re looking from making a living FROM writing, then writing for content mills isn’t a great option, because the pay is very, very low. But when it comes to getting content written cheaply, it’s an option that many blog and website owners go for. The trouble is, the quality is usually very poor as well! HireWriters is the only platform where I have been impressed by some of the content written. But even when I paid less, the content was still of higher quality that other platforms I’ve tried. You can purchase a 300 word article for as little as $1.85. I usually go for at least the 1000-2000 word option and the cheapest you can purchase that word count for is $8.25 for beginner level and up to $32.40 for expert level. The best quality content I bought, was after I ordered from skilled level writers. I haven’t tried the expert level. However, if you do choose to opt for beginner or general level – it is sometimes skilled or expert level writers that pick up the work anyway! The great thing is, once you have found a good writer, you can add them to your favourites and also send them job proposals directly. If you like, you can read my full review here. 25% BONUS on your first deposit. Easy and quick to sign up & purchase content. You can decline content if it’s not up to standard – or ask for a revision. You can add good writers to your favourites list. Writers are required to be native English speakers. You still risk getting low quality articles, particularly if you go for beginner level writers. The first article I got from IWriter I paid for, but did not end up using. It was not great quality at all. However, the good thing is you can reject the articles if they’re very bad. BUT the third article was actually really well written. $12 for 1000 words and while I had to do a bit of tweaking, I can now save this writer for future reference. The best advice I can give is that you really need to be incredibly specific about what you want – and be prepared to pay more for better quality. Some things you may take for granted as obvious and you will end up disappointed with the result. You can also ask for different 4 levels of writer, ranging from basic, to elite plus. For a premium writer, you could charge $10 or less for a 1000 word article – but at the upper end you’d be paying over $60 or more for a 1000 article. At the most basic, English/grammar can be poor and the content does not appear original or in depth. The good news is, you can test this website out very affordably and get a feel for it. Even if you don’t always use the article as it is, it can be used as a starting point – as a basic outline to work from for example and that could still potentially save time. Whatever articles you receive make sure you check articles for plagarism – something like copyscape is a useful tool. Very quick to deliver – normally in a matter of hours you get an email to let you know your article is ready to review. Can be affordable – but paying more will lead to better quality writers picking up your job. You can reject the article if it’s not right or poorly written. If you find good writers on there, you can send jobs directly to your preferred list of writers. Some poor quality content at the lower end of the scale – which isn’t worth bothering with in my opinion. You may take some time, (and money) finding writers that are OK. Some cheap articles I’ve requested were clearly spun – you can report articles as spam. Ultimately, it doesn’t cost much to check it out and you can get some very quick content written. 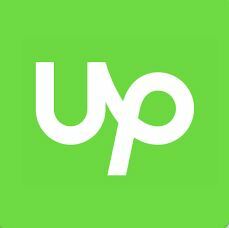 Upwork is a really easy to navigate site and it’s easy to post up jobs – when I’ve posted jobs in the past, I have received a large response. It’s helpful to be able to look through a wide variety of applicants. You can state on your job post how much you’re willing to charge – so there is rarely any confusion on that front. You will also be able to see examples of their work and reviews for their previous work completed. 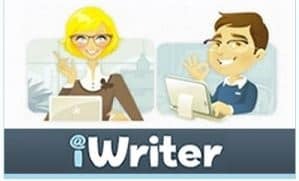 If you’d like to build an ongoing relationship and find writers that can write content more frequently, this could be a good option. Like I mentioned previously, You really do need to be specific about what you want your article to contain, in order to get the best results. Outline exactly what you want, linking to examples that you want them to research, mention how you’d like the tone and whether you’d like a particular conclusion in mind. For example, I once forgot to tell a writer that, having already researched a topic, I was looking for an unfavourable review – but they wrote quite the opposite. That wasted a lot of time – clearly, this is vital info that will completely change the entire article. So, be very clear in what you want and you’ll get the best result. You can post your job and expect to get lots of people applying for it. You can check out samples from members and get a good idea how good they are by checking out their reviews. You can suggest a set amount per job, so it’s easy to set yourself a budget to stick to. You can find really good writers on a budget if you look hard – especially if you’re willing to trial someone that is new to Upwork. If you don’t like confrontation, you may find it hard to let people know you’re unhappy with the result. It may take some trial and error before you find the right match. Some freelancers are unreliable and take longer to deliver than they say, which can be frustrating when you have a deadline in mind. I discovered SEO clerks via another blogger in my niche. While I haven’t used any of their other services, I have purchased content. They have plenty of freelancers there – where you can find jobs for anything relating to your website, including writing content and pay can be very reasonable. Again, you need to be specific and provide examples of the sort of thing you may be after and places they can research the topic. Check out the freelancers rating and experience. Often freelancers may provide a variety of services, so connecting with someone on there could become beneficial in more ways than just content writing. They also have an online community, where you can participate, post relevant discussions and engage with other people on there. Ultimately, it can be a good place to network and build relationships long term. Find low paying content or other gigs for a reasonable price. Find a variety of freelancers who will be knowledgeable in your niche. Be cautious, scammers will exist in any freelance community. If you’re looking for super quality, you will have to pay more. Another idea and one that I haven’t personally yet explored, is to seek out other bloggers in your niche, who are just starting out. You could use something like ninja outreach for this. You could find really talented writers this way, who may be more than pleased to get a backlink from a blog more established than their own. You could also seek out writers by posting your guest post as a job. For example, some Fiverr gigs are for posted looking for guest posts. The only problem here is, you’d need a thick enough skin to be able to reject a whole lot of people if you’re only looking for high quality! For both of these last options, you’re going to want to have a blog that is somewhat established already. It’s doubtful someone will jump at the chance to contribute to a blog that only started a couple of weeks ago. So, what has your experience been outsourcing content? If you haven’t taken the plunge yet – what’s holding you back? hello and thanks for sharing, deciding to start your own blog is one thing, staying in this game is something else, many bloggers do quit like you said because of all the hard work and not a dime to show for it.It is also amazing though how many bloggers are having great success and cashing in on that success all the way to the bank with a big smile.But like you said it maybe something that the unsuccessful was not doing. Blogging may be good business but it is a lot of work also and you will have to follow the rules and play by the game if you are to have success. Writing good content is a challenge…. Most things worthwhile requires hard work and a stay with it attitude. Because it is only one of you, outsourcing may be a plus, however, I have to say that your authentic writing comes from you. In should be improved upon. In selecting a good writer, they must be compatible with your intended thoughts. What do you think? Thank you for the info….! Hey Herman – you made a good point. The writer should somehow be in tune with you, because your audience is often used to your voice and likes your voice. One thing you can do is share one of your articles with the writer, so that they know your style and tone. I sometimes tweak articles so that they fit in more – however, I am going to start linking writers to articles so that they know how to write a review in my style. I used iWriter in the past and wasn’t impressed with the quality of the articles I got, so I don’t rate them highly. I haven’t tried any of the other resources you mentioned but I did order some articles from iNeedArticles that I was pretty happy with. I had to tweak them a little but they still saved me a ton of time in writing. I’ve never received an article that I was happy to post as-is onto one of my blogs. In some, I had to fix spelling or grammatical errors. In others, knowing a subject very well, I was able to spot factual inaccuracies and fix them. Hiring writers is a double-edged sword. If you know your niche well, you’ll spot when a writer knows less than you or pretends to know as much so rejecting an article or reworking is necessary. Or you know little about a niche and rely on getting a knowledgeable writer and you may end up posting inaccurate information on your blog as a result. I agree Gary – it depends on the article. For example; one of the articles I asked for was about content mills! Therefore, someone already writing for a content mill is likely to have experience. I wouldn’t want to give too much of a detailed article to someone who isn’t experienced – however, with Hirewriters, you can also search for writers who have knowledge in a particular field. I’ve never tried iNeedArticles – I will check out that platform, thanks!